Used GE CT-i Performex For Sale. Refurbished, Pre-Owned & Reconditioned CT Scanners at Reasonable Prices. Used and Refurbished Radiology Equipment and X-Ray Equipment, Used and Refurbished Diagnostic Imaging Equipment, Used Cath Labs, Used C-Arms, Used MRI Systems, Used CT Scanners, Used PET Scanners, Used Nuclear Medicine Equipment, Used Mammography Equipment, Used Fluroscopy Equipment and Used Cardiology Equipment. 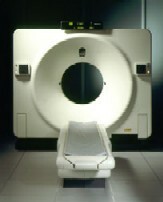 Description: GE CT SCANNER MODEL CTi PERFORMEX - Originally a HighSpeed from 1995 and upgraded in June 2000 to CTi Performex. Performex tube with 812,394, Version 6.1 Software. Rotation count around 10 million, Octane computer, SMART Prep, SMART Ma, smart View, 0.8 Second option, 48 kW power generator, CT fluoro.